Last year, Brooklyn's boyfriend Lucca died in a car accident. His best friend (and the driver) Gabe has just passed away of a drug overdose. 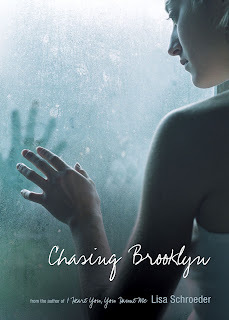 Unlike Lisa Schroeder's other novel in verse, I Heart You, You Haunt Me, Brooklyn isn't being visited by the ghost of her boyfriend...instead it's a terrifying version of Gabe hunting her in her dreams. Lucca is doing some haunting, but he is visiting his brother Nico, urging him to help Brooklyn. Both Nico and Brooklyn refuse to admit to each other that they see ghosts, which is the only thing that would help them move on. Told from the perspectives of Brooklyn and Nico, this book supports my belief that having a plethora of novels in verse will hook readers. Chasing Brooklyn is a companion to I Heart You; the characters attend the same school and briefly interact with each other. I love when authors do this, and it gives me hope that I will see Brooklyn and Nico in future books. In my opinion, Chasing Brooklyn is a much stronger novel: the dual narrators flesh out the story, the reactions to the hauntings are more realistic, and Schroeder has found her groove as a writer. I particularly enjoyed that all the characters are likable and their response to Lucca's death evolved gradually and subtly. While death plays a central role in the story, the main message is about hope and perseverance. I am excited to add this to my library and share it with readers who enjoy romance, the paranormal, and novels in verse.